Bull Shoals Dam was constructed on the White River in 1952 for flood control and hydroelectric power generation. As with other dams in the southeastern United States, operations from this project created coldwater habitat unsuitable for native fish species. Experimental stockings of rainbow trout and brown trout demonstrated exceptional survival and growth. Regular stockings of these two species began in 1955. 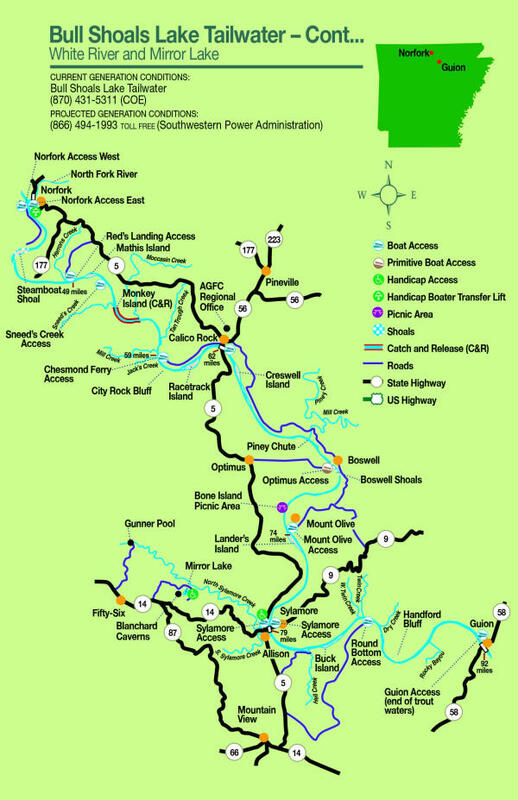 The AGFC manages trout fisheries in the White River from Bull Shoals Dam to the Arkansas Highway 58 Bridge at Guion. In 2007, the AGFC Trout Management Program began developing a comprehensive management plan for both the Bull Shoals and Norfork tailwaters. The purpose of this plan is to establish specific goals and objectives, which will guide future management of the trout fisheries in these waters. Central to the plan development process was an intensive public involvement effort used to help ensure the desires and expectations of the angling public were embodied. This plan will be revisited periodically to determine if management objectives were met and to ensure that plan goals are still in line with public values and interests. Elsewhere, the state has kicked off winter in style by releasing hundreds of rainbow trout in program ponds throughout the state. Each year, rainbow trout raised at the Jim Hinkle Spring River State Fish Hatchery in Mammoth Springs are delivered to community ponds in Arkansas once the water temperatures have cooled enough to accommodate the cold-water fish. According to Maurice Jackson, AGFC Family and Community Fishing Program Coordinator, the fish will be delivered beginning this week, and all program ponds scheduled for trout should have fish swimming in them in time for the Thanksgiving holiday.